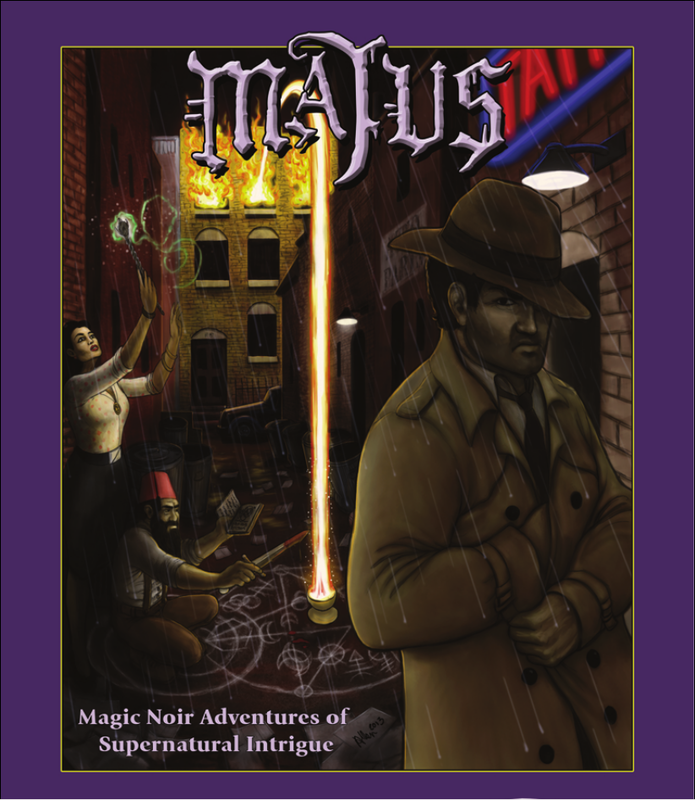 Majus is a new RPG in the Pacesetter line released by Goblinoid Games earlier this year after what I gather was a very successful kickstarter (I did not participate, I bought my copy after it was released). It was written by Michael Curtis, the creator of Stonehell Dungeon and from the cover, is described as “Magic Noir Adventures of Supernatural Intrigue”. First, a note. Until this year, I hadn’t played any of the Pacesetter games (Cryptworld was the first). So I was not familiar with the Pacesetter action table mechanic before a few months ago. The rulebook starts in with a few pages on the history of magic and the historical setting of the game universe. This part and the more detailed parts written for the Cabal Master [CM] at the end of the book are wonderfully unique and really speak to the imagination of the author. Your character is part of an Old Game, or Mehen, a shadow war between Maji that dates back millennia and revolves around the mysterious Skein, something you all seek to control. Details on exactly what the Skein is are left to the CM, but there are suggestions later in the rules. The next part of the rules details character creation and skills, and, as far as I can tell from my limited knowledge of Pacesetter games, is fairly standard, albeit with additions for magical spells or adits. 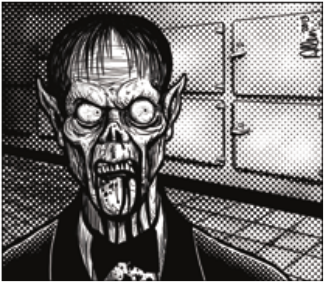 Beginning characters can choose three adits, or forego one so that they may pick an extra paranormal talent. Some of the paranormal talents are used in the other Pacesetter games, but the magical adits are totally unique to Majus. Character creation isn’t quite as fast as I am used to in my rules-light D&D retroclones, there are more abilities and the scores used to determine base success with adits, paranormal talents and skills are calculated using the average of two or three abilities. Not hard, but given how standard these formulas seem to be in the Pacesetter family, this screams for an online generator of some sort. Characters don’t progress in levels, but they can expend experience gained during adventures to raise ability scores or to increase skills or magical ability. I thought this was a good way to model character improvement, each player can ‘tune’ their character as they see fit, allowing for lots of variation between characters who would otherwise have the same skill sets. There are also plenty of skills to choose from, they are broadly divided into combat and non-combat groups, and range from boxing and martial arts to disguise, medicine and the occult. The latter is unique to Majus. This is also where the player gets their first introduction to the action table concept, which is common to all the Pacesetter games. When a player wants to do something, the CM has them make either a general or specific check against their base skill score, adding or subtracting any modifiers as needed. This is a percentage roll. The check either succeeds or fails outright (general), or has a variable effect in the case of success (specific). The variation is based on how much the percentage die roll succeeded by. I found this to be fairly straightforward, and I like the idea of having a single chart the CM and players can reference during play. Next is the chapter on magic. This tells us how magic works, the time requirements for adits (spells), and has detailed descriptions of the adits themselves. There are 11 adits in total, and each has a different effect based on the skill of the caster – specialist, expert or master. These are the same skill levels used in paranormal talents and combat/non-combat skills, and the consistency is appreciated here. Most of the adit effects also vary based on a specific check made against the action table, meaning there are lots of different ways a spell could succeed. The spells are animagic (animal control), blessing, charging (making of magical artifacts), counterspelling, divination, glamour (magical disguise), healing, hexing, summoning, warding and weather control. I like that the effect of each spell varies based on caster skill, with a bit of luck thrown in. In my mind, this keeps the game interesting. You never know when your ward could fail and that summoned elemental could decide to test your defenses. Next are paranormal talents. As I noted above, some of these are common to other Pacesetter games, but I noticed some unique ones as well, including aura sight, dowsing, and mesmerism. These work the same way as skills and adits, again a welcome consistency. The next chapter deals with character action, game time and the sequence of play in combat, magical or otherwise. This section appears to be identical to that in the other Pacesetter games, with the addition of magical adits, which are lumped together with paranormal talents. This seemed a logical place to put them. Some of the rules are quite detailed, especially the table s of bonuses or penalties for hindered movement and missile attack modifiers. 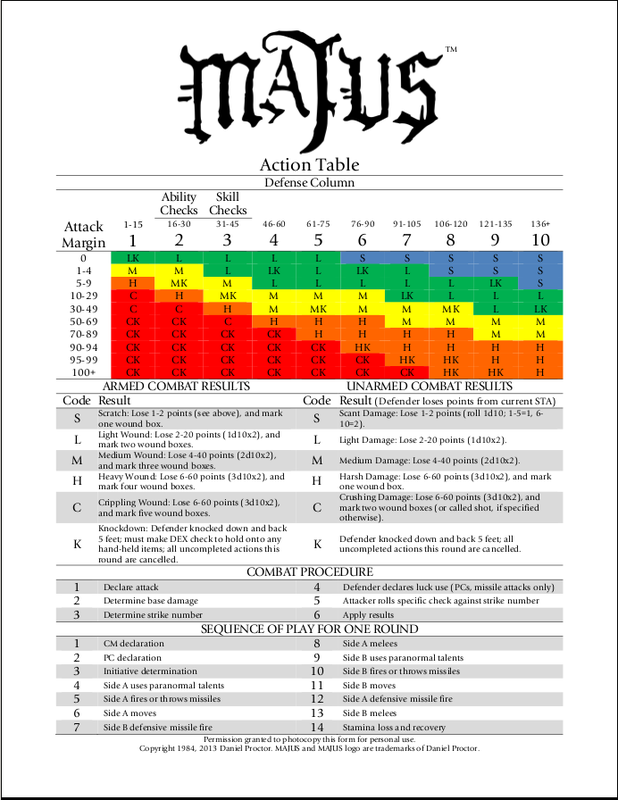 Attacks can be skilled or unskilled, but character skill and the action table is used to determine the effectiveness of an attack, not the type of weapon. This means that characters can use almost anything they find around them as a weapon (their boot, chairs, rocks, etc. ), while still having a chance to hurt their opponent. I get the impression (and my experience playing Cryptworld tends to confirm this, maybe those with more Pacesetter experience can comment) that combat can be quite deadly – characters are not superheroes, they are sometimes fragile humans albeit with special talents. Successful attacks reduce a character’s stamina, when that reaches zero, they are unconscious. But critical attacks can also cause wounds, and when a character is reduced to zero wound points, they are dead. I noticed there is a way to resurrect characters in Majus, a master of the summoning adit can call on a greater spirit to restore life – although the rules imply there is great danger and possibly great cost to this (the specifics are left up to the CM). Next there is a chapter on dealing with non-player characters (NPCs). There are rules for NPC reaction, specific situation checks, and the effects of bribery. These rules are simple and useful – they are referred to in various parts of the rulebook, including the reaction of summoned creatures to the Maji. Next there is a section written specifically for the CM, meant to supply ideas for a Majus campaign. It talks about the general magic noir setting of the game, options for what the Skein actually is, rules for astral adventuring, and notes on handling grimoires, which are tomes useful for summoning. Something called synchronicity is detailed – this is basically the ability of the Majus to call on luck to help in an action. The last part of this chapter tells about the Veiled Masters, a mysterious group of Maji that work behind the scenes to support or subvert characters for their own, unknown purposes. This section, although it is only nine pages long, is full of great ideas for campaigns. When I read it, I couldn’t help but start to flesh out my own campaign ideas. The final chapter, called Maj or Arcana, tells of the so-called Towers, which are groups of Maji with common goals. Presumably, the characters would start as lesser Maji in one of these Towers. There are also details on some known antiquities, which are artifacts with magical properties. These can be discovered or new artifacts created by characters with the charging adit. There is a listing of animal and supernatural creatures (many from myth or folklore, such as Ghuls, Golems, Ogres and Zombi), and finally a section on summoned creatures and their powers. The creature listing was rather short, but creatures (Things) from Cryptworld could easily be brought in to play here. So what didn’t I like? What would make this game complete would be an introductory adventure. It’s always nice to see how the author of a game would implement it in practice. 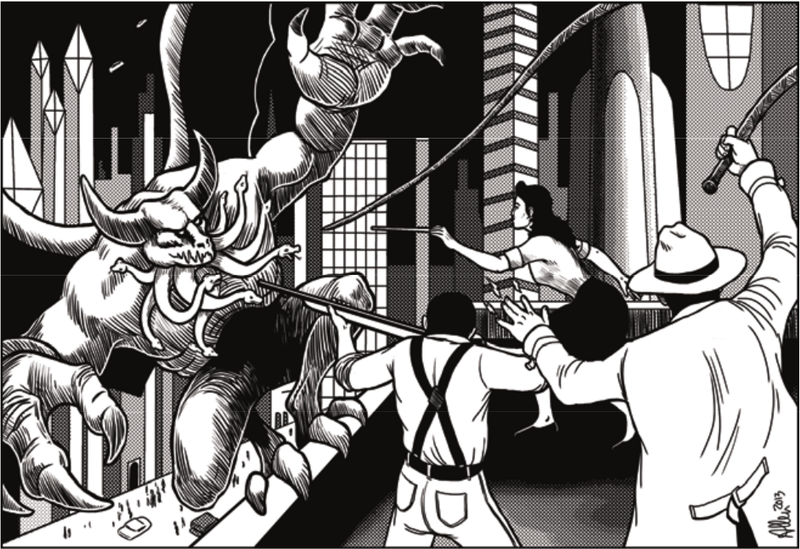 Most of the Goblinoid Games’ RPGs all come with intro adventures in their rulebooks, or have the benefit of being a rewrite of an older product for which adventures are still available (Time Master comes to mind). Majus has neither, and so I’m left feeling like the game needs a ‘jumpstart’ to be put in use, especially for gamers like me who have limited Pacesetter experience. Maybe a PDF supplement of such an adventure could be made available? Make it a quickstart-style adventure with pre-generated characters, and you would definitely get some interest. I also noticed two minor issues with the rules – the character sheet does not have a spot to list magical adits, although it does have a spot for paranormal talents and so the adits could be listed there. The action table also does not mention adits in the combat sequence, they should be together with paranormal talents. The rulebook itself is clear on when magic takes effect, however. These were probably just editorial oversights, and as I stated they are minor issues. All that said, my overall impression of Majus was very positive. I really like this game and can’t wait to play it. There is more than enough here for a creative CM to build on. It could also be used as a supplement for other Pacesetter games – the magic rules are well thought-out and could be incorporated directly into an existing Cryptworld or Time Master campaign. You could also easily do the reverse and pull in elements (like creatures) from other Pacesetter games into your Majus campaign. The artwork and layout are excellent.